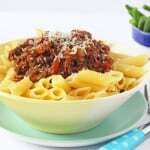 A quick, easy but super delicious recipe for Sausage Meat Ragu. This simple meal has fast become a favourite in my family and I think you will love it too! Have you ever gone to make a recipe, realised you were missing one of the key ingredients but carried on anyway and just subbed something else in? 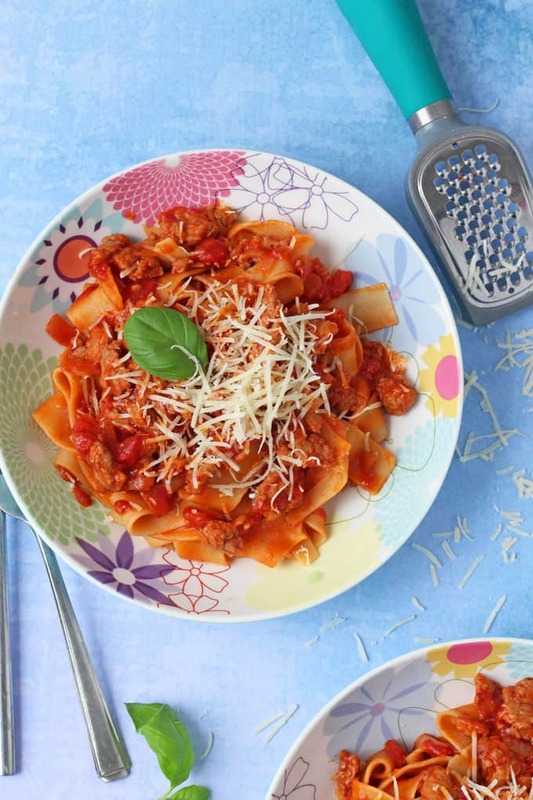 This is pretty much how my Easy Sausage Ragu recipe came about! I had planned to make a simple spaghetti bolognese one evening but when I went to the fridge the beef mince that I thought was there wasn’t but I did have some sausage meat. So I decided to continue with my plans for dinner and just sub in the sausage meat instead! I have to say that this was one of the most delicious mistakes that I have ever made! 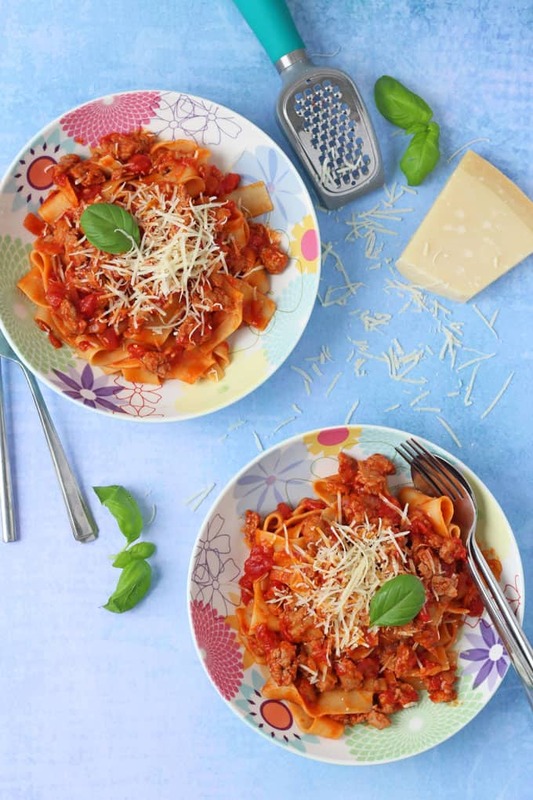 The great thing about using sausage meat is that it is already packed full of herbs and spices which all infuse into the tomato sauce, meaning you don’t have to spend hours cooking it down to get lots of flavour. This recipe takes me 20 minutes to cook, making it ideal to whip up on a busy mid-week day. It’s also a great recipe to batch-cook, so you can double or even triple the ragu ingredients and store in the freezer for busy days ahead. 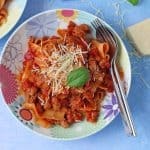 I served my Sausage Meat Ragu with parpadelle pasta but don’t let that put you off if you don’t have any or can’t get your hands on it. It works just as well with any type of pasta. 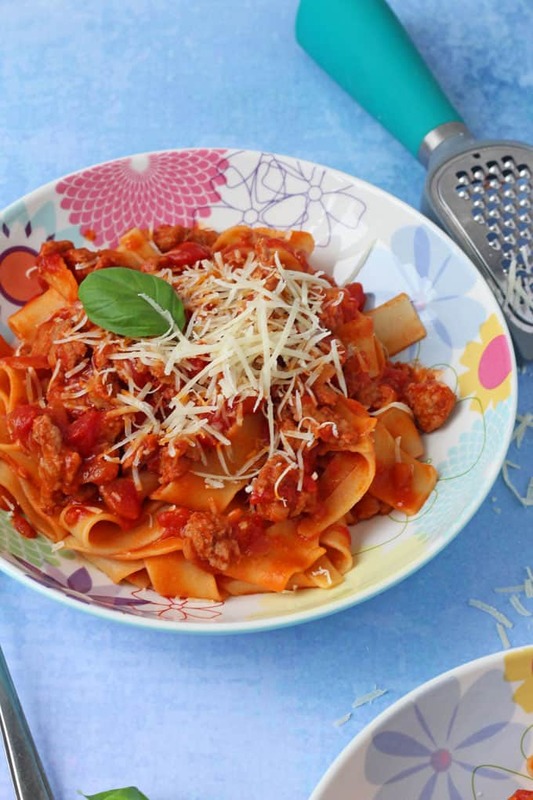 A quick, easy but super delicious recipe for Sausage Meat Ragu. 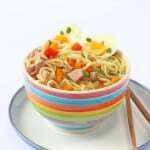 This simple meal has fast favourite in my family and I think you will love it too! Heat the oil in a large frying pan and add the onion. Cook for approximately 3 minutes until the onions are soft. Add the garlic and cook for another minute before adding the sausage meat. Fry the sausagemeat for 5-6 minutes until it is browned all over. Add in the chopped tomatoes, beef stock, red wine and tomato puree and mix well. Bring the ragu to the boil and then reduce to a simmer for approximately 12 minutes until the mixture has cooked down and the sauce has reduced. Be careful not to reduce it too much as we still want to keep some liquid in there for when we add the pasta. Whilst the ragu is simmering, cook the parpadelle (or any other) pasta in a separate saucepan. Drain and then add it to the ragu. Mix well and then serve with some grated parmesan and fresh basil leaves. This ragu will keep in an airtight container in the fridge for up to 48 hours. 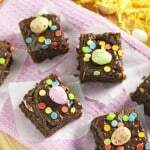 It can be reheated on the hob or in the microwave. If you want to freeze it, I would recommend freezing only the ragu sauce without the pasta. Didn’t have chopped tomatoes, wine or liquid beef stock but used a whole can of puree ,extra water and powdered beef stock and turned out ok.
One of my all time favourite recipes! I cannot explain just how good this tastes. We love lover love it! Thank you posting this. So so good! Definitely making this again.